Free Download Archimedes: Eureka! Collector's Edition Game or Get Full Unlimited Game Version! The great Archimedesâ€™ latest invention has destroyed the beautiful town of Syracuse! Guide Archimedes and help rebuild the beautiful city! In order to get advantaged of playing Archimedes: Eureka! Collector's Edition full unlimiteg game version you must register the game. The great inventor Archimedes presents his newest and most advanced invention: a large winch powered by the wind. Even Hercules is no match for this mechanism! However, itâ€™s no match against nature as a strong gust of wind destroys the device, which in turn, destroys the entire city of Syracuse. 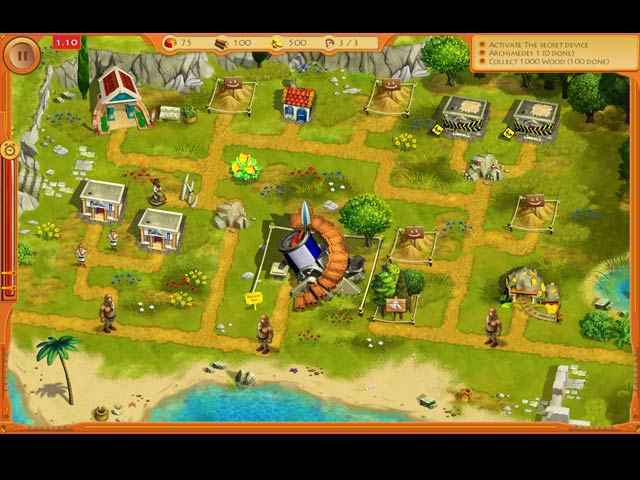 Can you guide Archimedes and help rebuild the beautiful city? The great Archimedesâ€™ latest invention has destroyed the beautiful town of Syracuse! Guide Archimedes and help rebuild the beautiful city! Help Sonya save her sister from unknown villains! After Lily’s life force is stolen it’s up to Sonya to get it back!